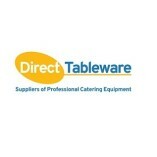 Direct Tableware is a leading supplier of catering equipment for food and drink service establishments. We were established in 1968, starting out as a supplier of quality cutlery to catering, restaurant and hotel businesses. Since then, our... product offering has expanded, and we now offer establishments a complete range of professional products including crockery, glassware, cutlery, buffetware, kitchenware and table accessories.